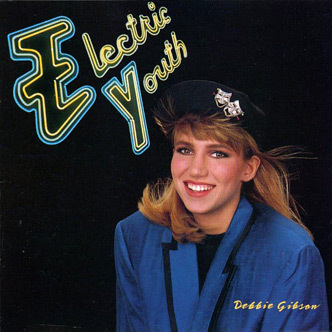 Debbie Gibson was the pop princess of the 80s. Before Brittney and Christina came along we had Debbie. Our decade was a little more subtle, a little more wholesome and our youth was well, a little more ELECTRIC. How cute was Debbie? She’s so sweet she kinda makes my teeth hurt! Many a bus ride to school was spent in the waaay back with my Sony Walkman blasting this song, my black eyeliner running while bawling to this tale of teenage heartache. 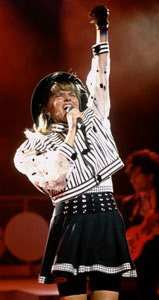 “Foolish Beat” set a record for Debbie Gibson – at 17 she was the youngest artist to write, produce and perform a Billboard number one single. She’s even in the Guinness Book of World Records for this. She also had a perfume (Electric Youth, naturally) and starred as Eponine on Broadway in Les Mis, which further makes me say WHAT CAN’T YOU DO, DEBBIE GIBSON?!? Debbie had a sweet, wholesome look to go alongside her sweet wholesome image. Think suspenders, rolled up jeans, multiple Swatch watches, and a hat. This fun 80s look that doesn’t have to exist only in your dreams – you can easily transform yourself into the ultimate pop princess this Halloween. Hair can be one of two ways, straight with bangs peeking out from under that hat or a crimped, side ponytail will also do. Make up is easy, some black eyeliner and pretty pink lips. Oh, and a spritz of that Electric Youth really completes the look nicely if you want to smell like Debbie as well. Accessorize your look with some stacked bracelets/watches and big geometric earrings. And why not add a giant pin to your hat or blazer lapel? Bonus points if you have a big gold one with comedy and tragedy theatre masks like I did back in the day. So there you go, a fun easy-breezy sweet looking (and smelling) Debbie Gibson costume for your pleasure. Please excuse me, while writing this I’ve had “Foolish Beat” on a loop and now need to take some time for myself.